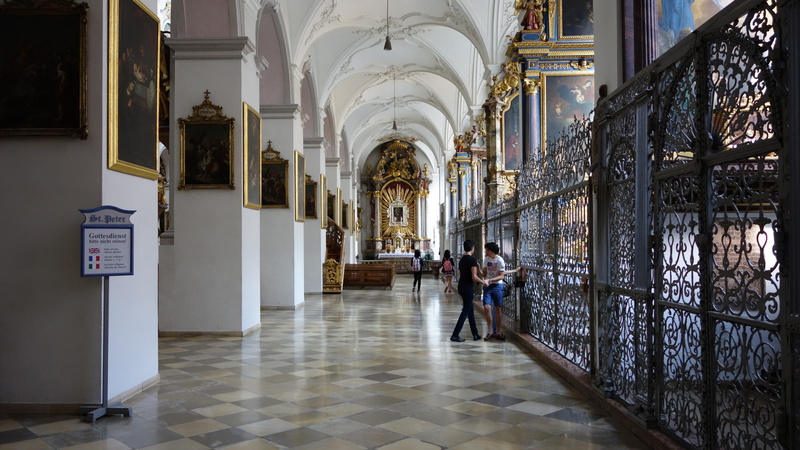 Over the last few decades, religious belief in Germany has slipped, but not to the extent seen in other Western European countries. 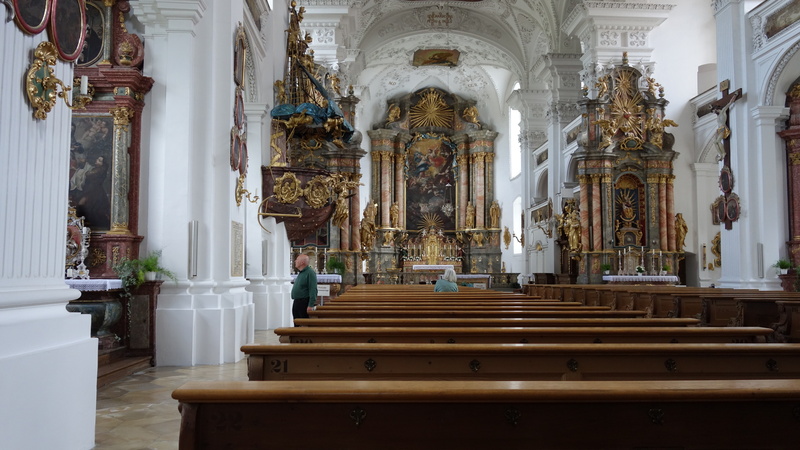 The most recent report I could find with statistics on German belief suggests only a marginal increase in atheism in the country over the last thirty years. 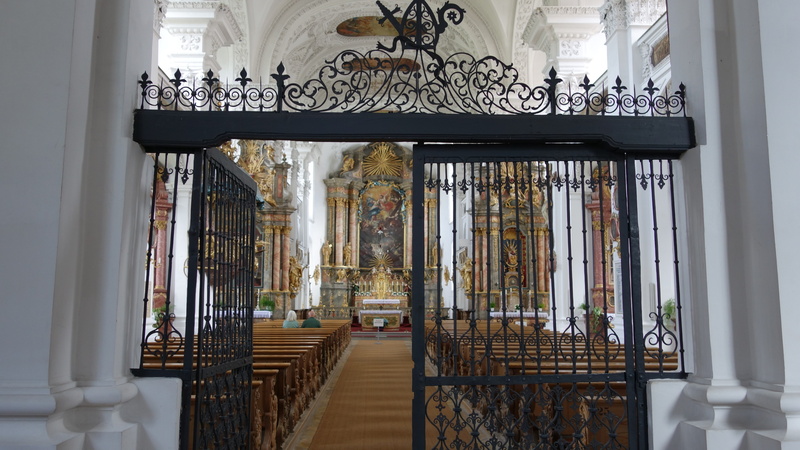 It was hard to know what churchgoers made of the ‘saints’ who rest in their churches (especially with my non-existent German), but it was very evident in many of the towns we visited that despite their age, the churches were still active in local life. One of my regrets about the visit to Irsee is that I haven’t really taken any photos that convey the grand positions from which Faustus and his mates look down upon you: they all gaze commandingly across the church at a height of about nine to ten feet. When you’re standing right in front of them, you’re looking directly at their feet, and have to raise your head to take them in fully. 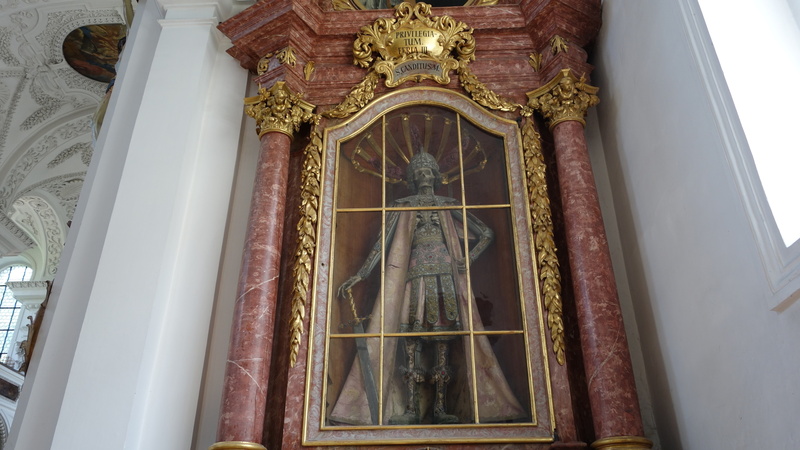 We only saw one other church (in Switzerland) where a saint was positioned so dynamically, and I think I prefer it to the recumbent saints which were so popular elsewhere. 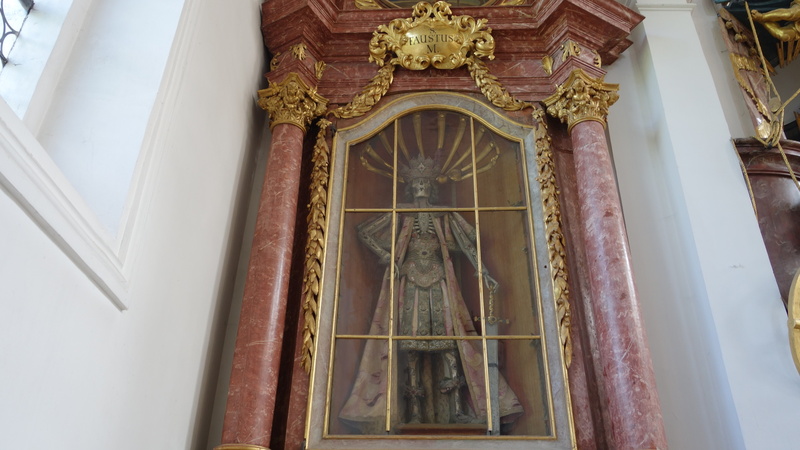 I don’t know why different churches chose to position their saints so differently, and what the significance of any one position was, but the three saints at Irsee make a powerful and intimidating statement when you encounter them. 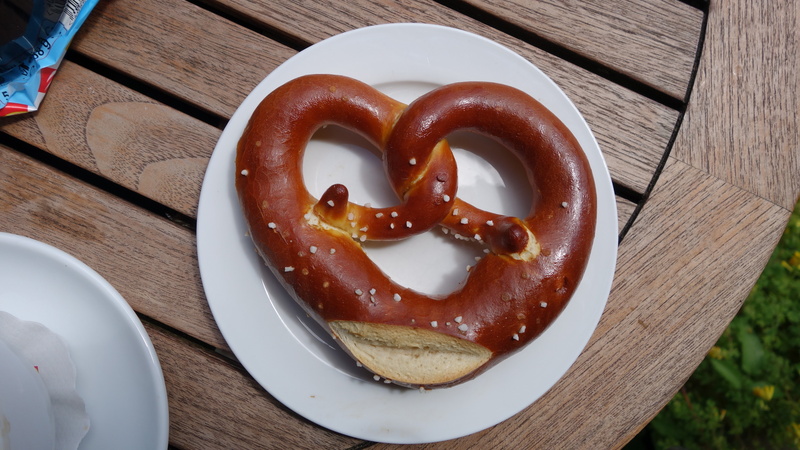 If you do visit Irsee, walk ten minutes across the town to Backerei Koneberg for a bagel. Extra points if you can find the pictureqsue pathway through the centre of the village which means that you avoid hiking along the road. 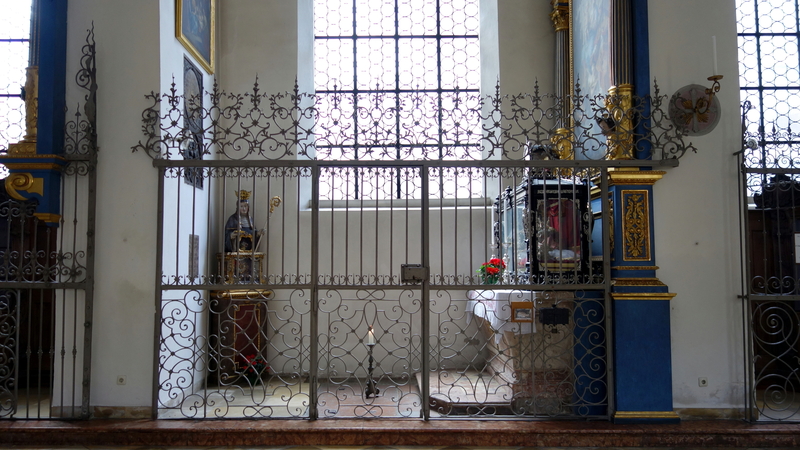 Onwards from Irsee to Munich, which probably hosts one of the easiest catacomb saints to visit, in the Church of St. Peter. It’s the oldest parish church in the city, and like all historic urban churches, it’s quite nice inside. 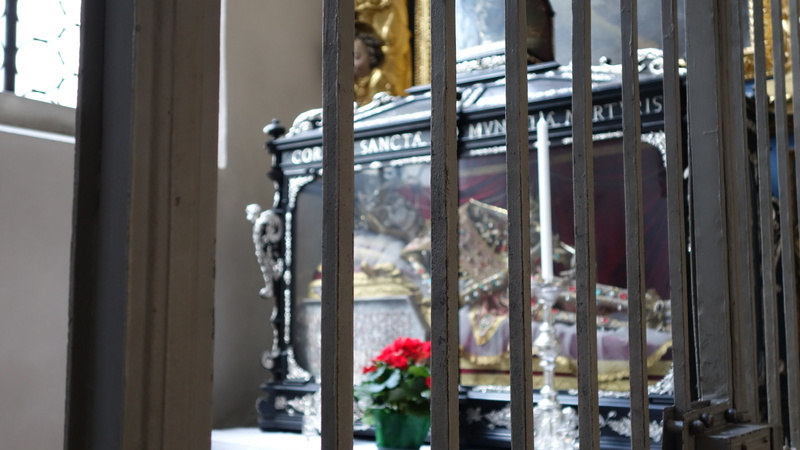 I wouldn’t recommend it if you’d like to get a close look at their saints though, because they have locked all their precious relics behind bars. 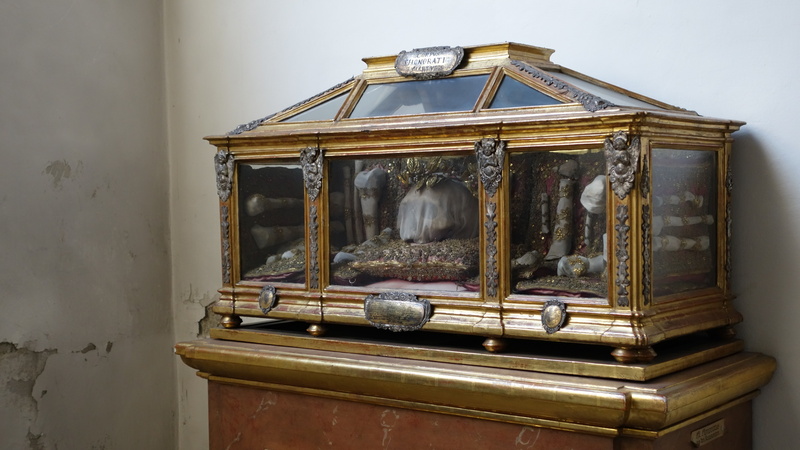 Munditia (pictured above and below) is one of the best preserved saints we saw on the trip, potentially because of her prime location (she even had a personal collection box, which was not a courtesy extended to most of the other saints we saw). 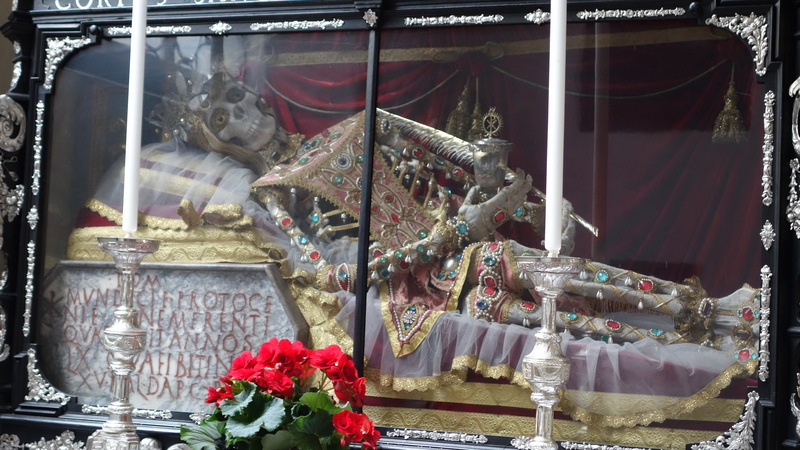 I was surprised by the prominence with which many of the catacomb saints were be displayed in the churches we visited. It’s generally accepted that these skeletons are (as I mentioned in my previous post) merely those of your average Roman, caught up in a bizarre posthumous drama. 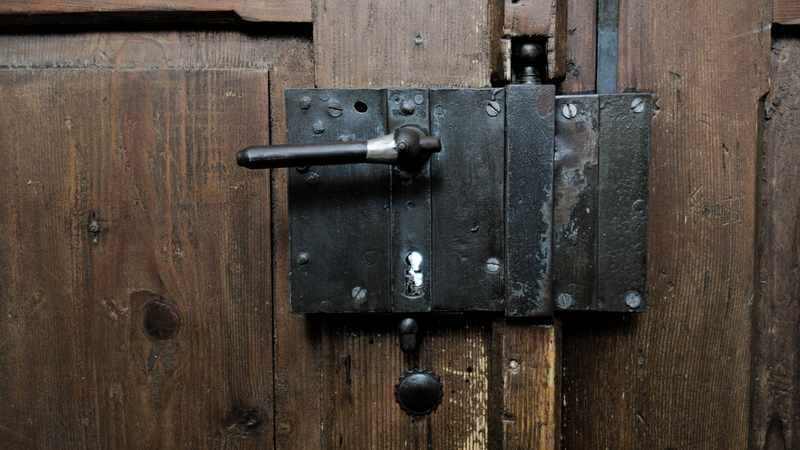 I was expecting that most churches would not give much space to their catacomb saints, either out of disinterest or embarrassment. Of course, thousands of skeletons were sent out across Europe, and not many are listed in Koudounaris’s book: I’m not sure what has happened to the rest. 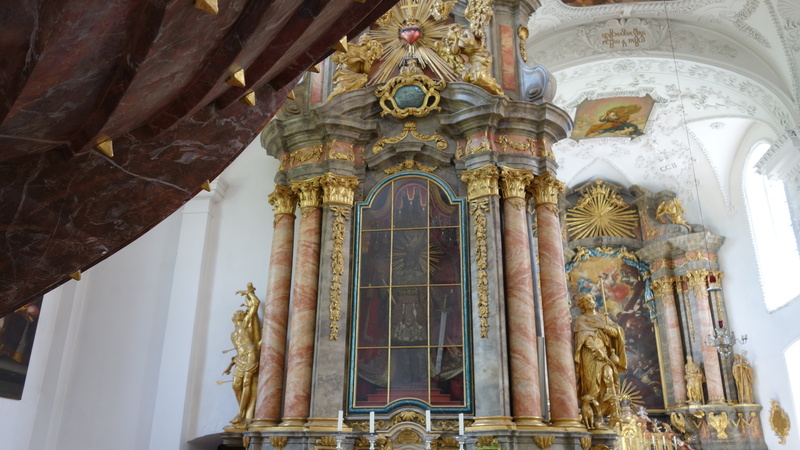 Yet in the churches that do display them, they take pride of place, staring imperiously down at you in Irsee and brightly bejewelled in Munich. 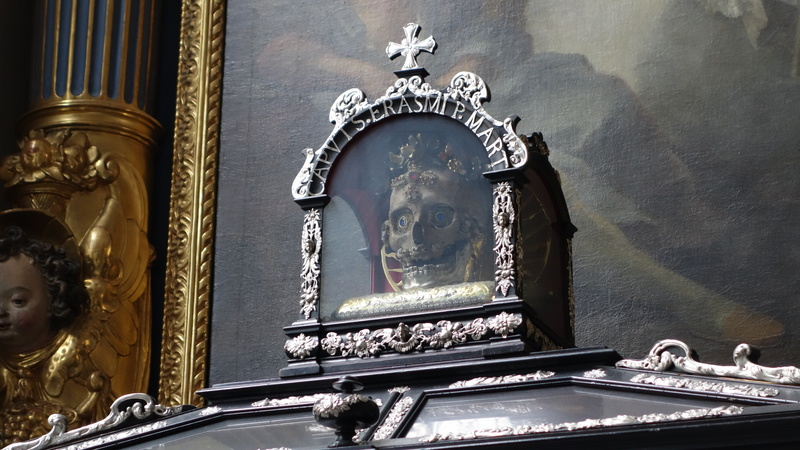 At least for these skeletons, in a rather strange and roundabout manner, sanctification has really occurred. 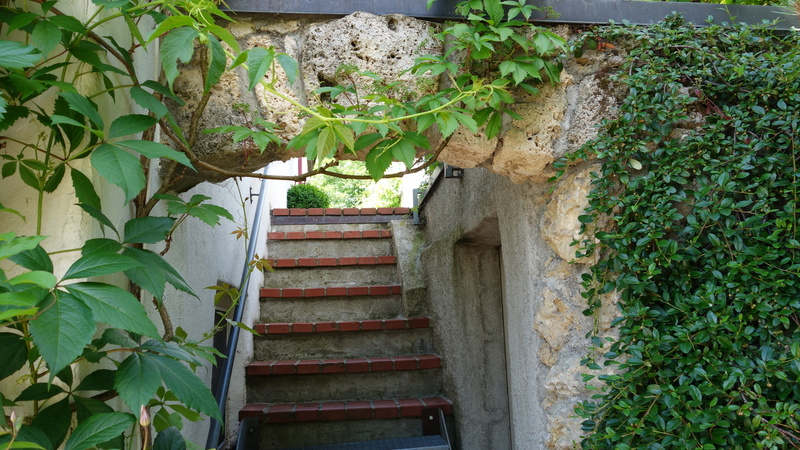 I’ll leave any philosophical conclusions as an exercise for the reader, and press on to my favourite part of the trip: the Alps, ski-lifts and Austria.